The pa ce of change with the primary election numbers has slowed, but the folks at the Registrar of Voters office keep on counting so the numbers continue to change. As of Saturday most of the races remain the same. 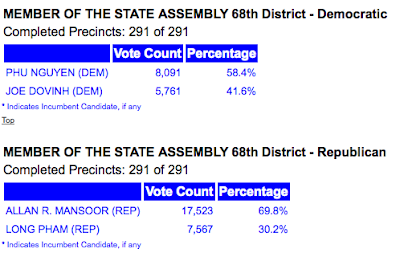 Allan Mansoor's lead over Long Phan has slightly diminished to just under 70%, but is still unsurmountable. He will face Democrat Phu Nguyen for the 68th Assembly seat in November. 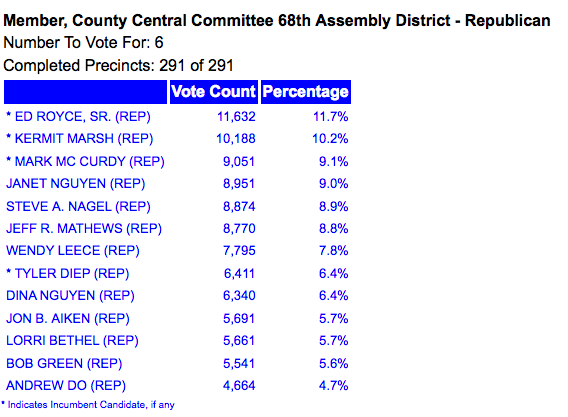 Wendy Leece seems to have lost more ground in the race for one of the six seats on the 68th Assembly District Republican Central Committee. Costa Mesa Parks and Recreation Commissioner (and BIG Mansoor supporter) Jeff Mathews leads her by enough votes now for the final seat that his position seems secure. Measure C, which locks in the zoning for the Orange County Fair and Event Center continues to be a landslide, with 9,687 voters (87.4%) who cast ballots on this issue voting a resounding YES! IS THE FAIRGROUNDS REALLY SECURE? Here's somet hing to chew on for the next couple days. With the overwhelming passage of Measure C the voters of C osta Mesa have made clear their preference for the Fairgrounds to remain basically the same. To change the uses of the Fairgrounds if sold by the State to Costa Mesa or anyone else it will require not only going through the whole Planning Commission/City Council process, but will also now require approval of the voters in Costa Mesa before anything can transpire. With that in mind, and with the s pecter of the Latino Caucus blocking the purchase by Costa Mesa because of the recent self-serving move by Mayor Mansoor and his friends on the City Council to declare our city a "Rule of Law City", I find myself wondering if the State might not step back and shift gears. You may recall that last year representatives of the State sent a harshly-worded letter to Costa Mesa, warning it NOT to do anything that might devalue or interfere with the sale of the Fairgrounds. We ignored that warning and went ahead with the zoning change and Measure C. However, Measure C only becomes effective IF the property is sold. HOW ABOUT A LONG LEASE INSTEAD? I wonder if our " friends" in Sacramento might decide to pull the property off the market and, instead, negotiate a long term - like 99 years - lease for the property instead? That way it remains in the hands of the State and, as such, is not subject to our zoning restrictions. With a long lease many developers would find that opportunity for use of that property to be quite desirable. We could see, literally, anything on that 150 acres - homes, commercial development, etc. Our "friends" in Sacramento could cut a juicy financial deal with lots of bucks up front to help with the budget and still have a long-term payout from the lease. And, they could get back at Costa Mesa for ignoring their warning and, very effectively, give us the finger! The potential for a very different mix of lessors is interesting to speculate about. Most of the apparently sympathetic "partners" the City has been dancing with in recent months probably couldn't come up with the up-front cash to make such a long lease work. But, maybe one of the now-wealthy Indian tribes would like to work a land swap for a long lease on 150 acres of prime urban real estate, close to three freeways, for a nice, new dazzling casino! You know, something that would make the Trinity Broadcasting facility on Bear Street look like a 25 watt bulb by comparison. Or, maybe, how ab out a nice, aromatic hog farm? Yes sir, that would be a nice addition to our community, wouldn't it? All those lovely ocean breezes we tout would carry the fragrance of that new industry through all of north Costa Mesa. This has always been the threat.....The 99 year scenario has been whispered about ever since the sale was cancelled against Craig Realty after the first auction. That was why advocates for stopping the sale were so supportive of the City's negotiations and the JPA with the existing entities on the fairgrounds represented in the American Fairs Deal. When Mansoor , Monahan, Bever, pushed for Righeimer as an "unpaid consultant" that's when we got worried. Sure enough, the deal gets changed , at the last minute , behind closed doors, to Facilities Management West. Large contributors to Mansoor.Too bad they had no state legislative strategy. We needed to have the state legislature pass a bill to "unring" the bell regarding the sale.Mansoor pretty much torpedoed that whole deal with his personal political ambitions getting in the way of the delicate state negotiations. I don't care if you agree with his "rule of law" declaration or not, in regards to the fairgrounds it was idiotic timing. Either Mansorr wasn't politically astute enough or he didn't care. 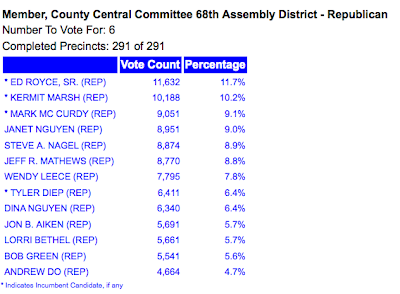 In either case , it bodes ill for his effectiveness as a state assemblyman. Also , Facilities Management West has already stated they would prefer to not be in a public partnership. A 99 year lease without any public control or oversight, profit sharing , or resposibility to the local community around them , would make them very happy. Measure C isn't the panacea, but neither is it a placebo. It was however, the only arrow in the voters quiver, and we hit the bullseye.